Law degree in hand, Kimberly Kauffman left Southern Methodist University Dedman School of Law in 1999 with her career all mapped out: she would work her way up at a big law firm and eventually become partner. That’s not exactly how things went. Now, as vice president and deputy general counsel at University of Phoenix, Kauffman is helping the university become a customer service ace for its employees. This is a pivotal time for the university, which was hiring new staff at an incredible rate when she became senior corporate counsel for parent company Apollo Education Group in 2009. Over the past few years, the university has scaled back on personnel, creating even more angst in the workforce. Kauffman downplays her role in reshaping the university’s culture, but she is undoubtedly a key influence. Few are better advisors on that subject. Kauffman’s career is marked by unforeseen circumstances and opportunities she’s made the most of. But in the beginning, everything was going just as she’d planned. Kauffman spent three years as a labor and employment litigator at Snell & Wilmer in Phoenix. Lewis & Roca LLP hired her in 2002 for commercial litigation with an emphasis on construction. The firm put her on the partnership track. She was working late preparing for a trial when a television news station broke the news that the war had officially begun. That didn’t stop Kauffman from pursuing her career. In 2005, the city of Scottsdale, Arizona, hired her as an assistant city attorney, a position she still looks back on fondly. The job got Kauffman back into labor and employment litigation, which she says she missed as a commercial litigator at Lewis & Roca. It also gave her the chance to expand into other types of litigation, primarily defending the city from court claims. She spent most of her time, however, advising the police and fire departments on HR issues. In 2007, Kauffman’s brother, also a labor and employment attorney, recommended her for a job he was leaving, an in-house role as assistant general counsel for US Airways. As much as she enjoyed city government, Kauffman thought about her future and took the job. A year later, Kauffman landed at Apollo Education Group, where she took the initiative to broaden her experience. She asked her manager if she could learn what he did in executive compensation and benefits. Kauffman earned more responsibility as her manager neared retirement. 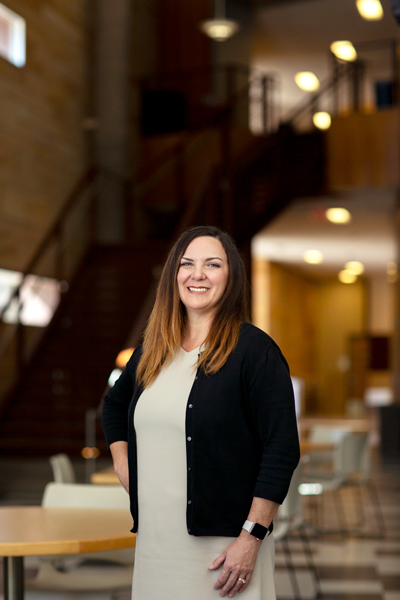 When she took over for him last September, she was ready to help the University of Phoenix HR department strengthen employee culture and staff relationships. Her input has shaped a number of initiatives that help drive employee engagement and satisfaction. For instance, the university has increased on-the-job training opportunities and created employee interest groups. The staff cafeteria has become more robust, regularly featuring different food themes and choices. “We want to offer great opportunities for employees so that even though it may take longer to get to that director-level position than it used to, they can still grow as employees,” Kauffman says. Kauffman is an ideal case study. All of her prior changes in plans helped lead her to the university and the experiences she gained along the way helped shape her for her current role there. But as Kauffman’s legal expertise continues to grow, so do her horizons. If her career has taught her anything, it’s that even the best laid plans can change at any time. Littler Mendelson would like to congratulate Kimberly Kauffman on this well-deserved recognition. Kim is a skilled attorney and an asset to her organization and the legal profession. She serves her company extremely well and is a great legal partner. Thank you, Kim for all that you do.